One of my favorite things about breathing new life into old furniture is that sometimes underneath all the layers a wonderful surprise awaits. 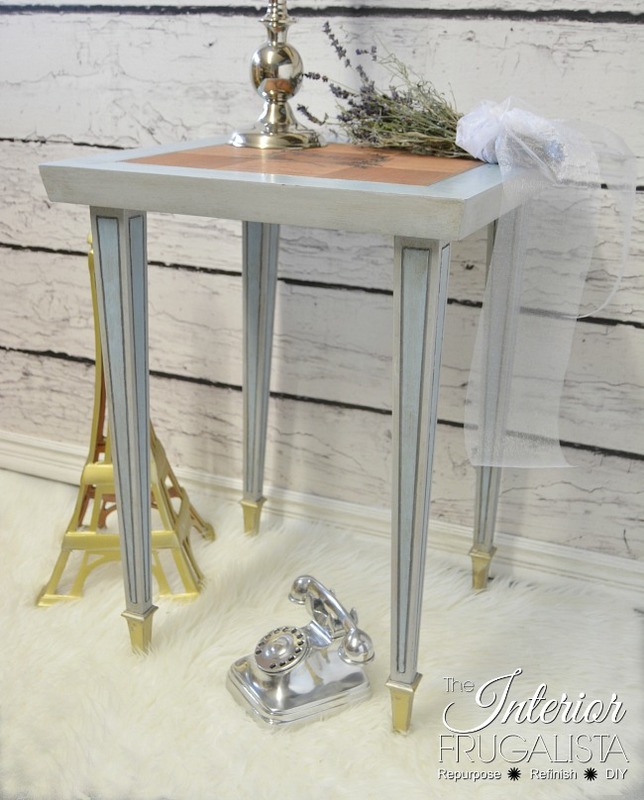 Such was the case with this neoclassical style side table found on Kijiji (Canadian Online Buy & Sell Site). 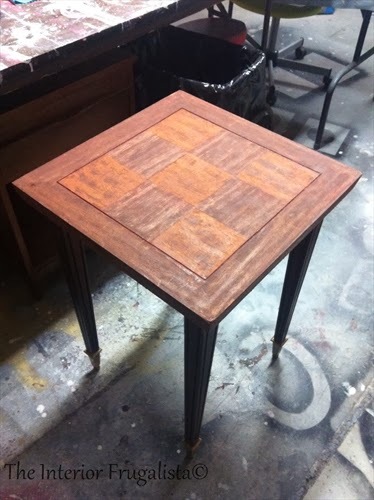 The person who listed it was selling their grandmother's belongings and had no idea how old the table was but that she had it for many years. The top was in terrible shape and sometime during her possession, someone refinished it with thick layers of dark gel stain. It took some elbow grease but what I found underneath was a lovely wood parquet top. I was so excited to dig into this makeover that it wasn't until after removing a couple layers of the thick gel stain that I realized I hadn't taken before photos. You can imagine how thrilled I was when I got to the last layer of gel stain and discovered the parquet wood underneath. Once I removed the last layer of stain I carefully sanded the top using mouse sander. The nicks and scratches on the legs were filled with wood filler. 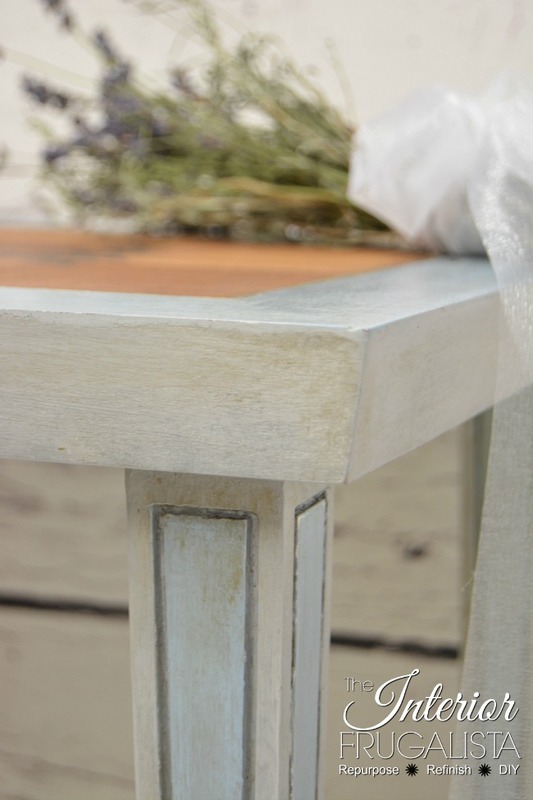 The legs and apron were chalk painted in the color Paris Grey from the Annie Sloan Chalk Paint™ line. The detail in the center of each leg was highlighted in the color Louis Blue. The chalk painted surfaces were given a coat of clear wax followed by dark wax, wiping away the excess. The following day the wax was buffed to a matte sheen with my go-to horse hair shoe brush. You read that right - just like shoes it gives the wax a beautiful sheen. Using a small artist's brush I applied Silver Gilding Wax into the grooves of each leg and Gold Gilding Wax onto the metal feet. Someone had painted them gold and rather than remove the paint, the gilding wax gave them a metallic lustre. 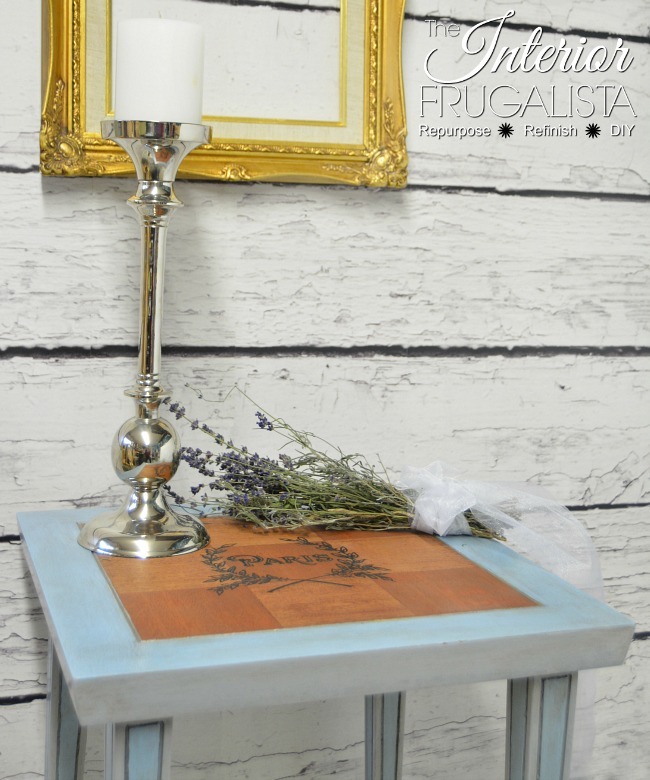 I wasn't happy with how the Paris Grey looked against the warm tones of the wood top and so I left the skirt painted gray but painted the edge around the parquet top Louis Blue. Rather than staining the wood top, I applied tung oil with a lint free rag. It took several coats before it stopped absorbing into the wood. The following morning while enjoying my morning java I stood over the table and pondered whether to add a little something to the wood top. 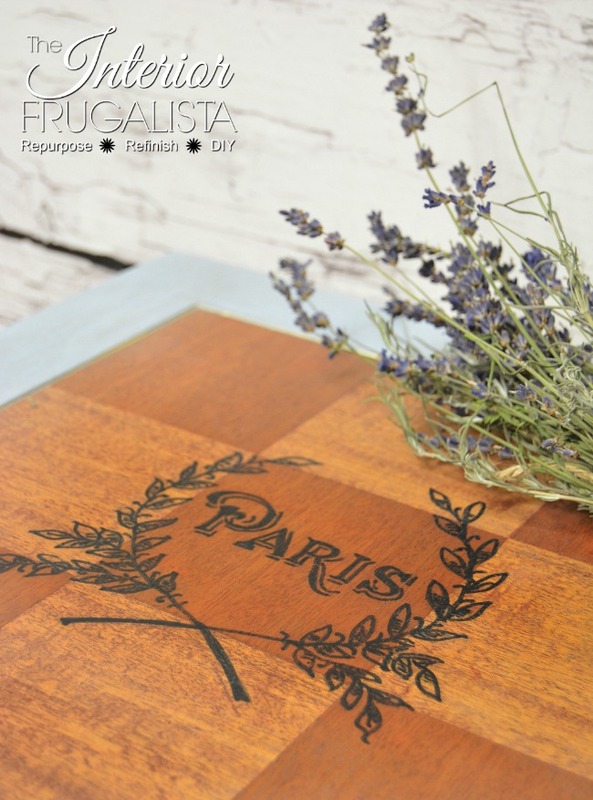 A quick visit to the Graphics Fairy website where I found this Paris Wreath graphic. After printing the graphic, place carbon (or graphite) paper behind and simply trace the details by pressing firmly with a pen. Using a black paint pen, trace over the carbon imprint on the wood. I was concerned the paint wouldn't take to the oiled surface but surprisingly it worked like a charm. Some pieces just need a pretty graphic before they feel complete. I've done several like this Vintage Executive Wooden Desk (which I'm kicking myself for selling). 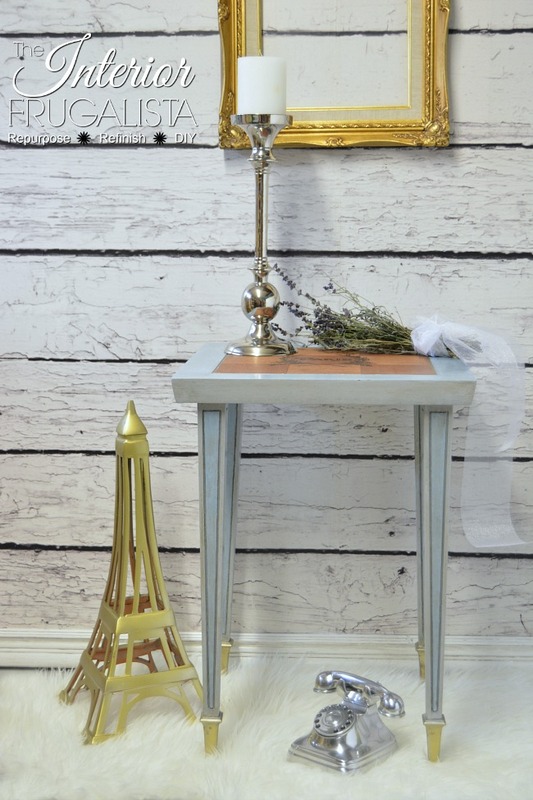 Or this French Provincial Clock Face Side Table and Nesting Tables. 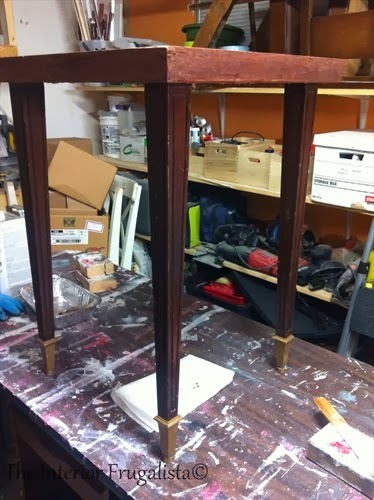 But my absolute favorite makeover where I applied a graphic is Mom's Stool Makeover. The intention while doing this makeover was to sell it. When placing the table in our Guest Bedroom to hold until the next market venue, I realized how good it looked in the space. The price tag was removed and it was used as a night table until the room was converted into a makeshift nursery for when our grandson comes to sleepover at Grandma & Papa's house. No longer having a use for the table it will soon be heading to my booth. 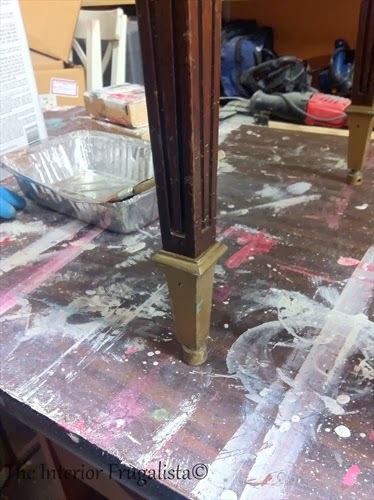 If you've acquired some old painted furniture, you never know what could be lying underneath those layers of paint. Sometimes it's worth the arduous task of stripping them to the original finish. Before pulling out the paint stripper you may want to try a Google Image Search first to see if you can find a picture of an original. Not only will you learn a little history about the piece but you may just find that it has some details you might otherwise not have known about hidden under the paint. 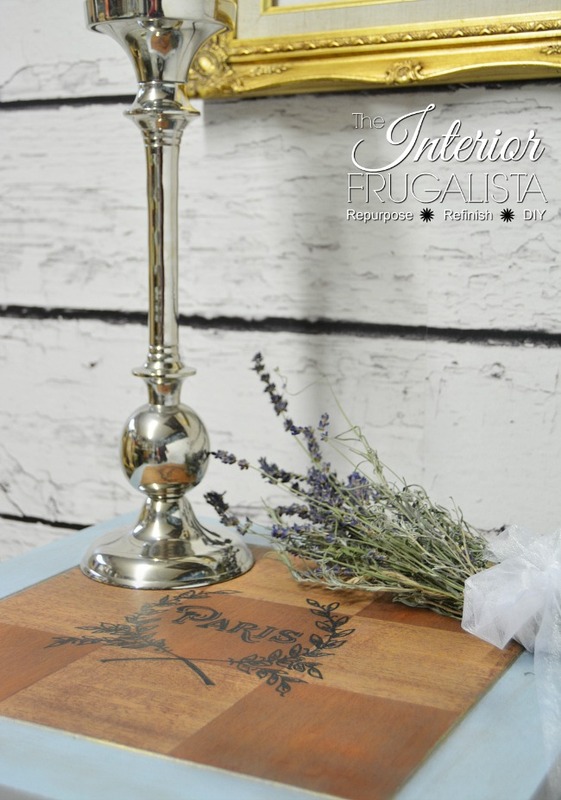 You will find this project shared at these fabulous PARTIES.